Advocacy Camp is next week! The second week of the legislative session got off to a fast start! On Monday, both the House and Senate Labor Committees held hearings on our Rest Break bills, SB 5190 (Senate) and HB 1155 (House). WSNA member Martha Galvez testified in both the House and Senate, sharing why this important legislation is needed to keep nurses and patients safe – see Martha’s testimony below. WSNA also testified before the House Health Care Committee on legislation related to surprise medical billing, HB 1065. This article in The Columbian has a good overview of the issue and this week’s hearing. Additionally, your WSNA team has been hard at work this week preparing for Advocacy Camp on Monday! WSNA is looking forward to welcoming nearly 500 nurses and nursing students as we engage in discussion and activity about how to effectively advocate for nurses and patients when meeting with legislators. On Monday, Jan. 21, both the Senate and House Labor Committees held hearings on our Rest Breaks bill (SB 5190 / HB 1155). Longtime WSNA member Martha Galvez traveled to Olympia from the Tri-Cities to share her experience with lawmakers. She did a fantastic job in advocating for nurses with her testimony before both committees! See Martha’s Senate Labor Committee testimony click by clicking here. We look forward to seeing these bills move out of these Committees, but we need your help. We know that when nurses speak, lawmakers listen! 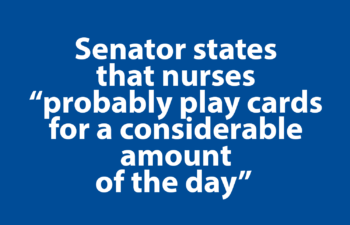 If you haven’t done so already, click here to tell your legislators to support rest breaks for nurses. This year WSNA’s Advocacy Camp is the designated activity for schools and students, with a revamped structure to facilitate learning. Enjoy a morning keynote from Lieutenant Governor Cyrus Habib, a buffet-style hot lunch and discussion with a panel of professionals with experience in advocating in the legislature. This year there is a flat rate registration fee of $25 for all participants – and parking is free. Haven’t registered yet? You can still register onsite Monday morning. Follow this link for details. Time will also be spent role-playing to prepare for afternoon appointments with your legislators. After lunch, you will head up to the hill to attend meetings with your legislators. This is a great opportunity for nurses to talk with their lawmakers about key issues, such as the need for uninterrupted rest breaks, as well as funding for school nurses, nursing education faculty and public health. For more on WSNA’s 2019 Legislative Priorities, click here. We are happy to offer 2.75 CNE contact hours this year! Visit the wsna.org for more information and Lobby Day registration. As news about our legislative priorities develop, watch for Action Alerts from WSNA regarding when to weigh in. 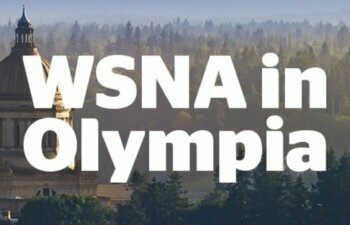 Of course, one of the best opportunities to take action is by joining your fellow nurses in Olympia for WSNA Lobby Dayand meet with your legislators face-to-face!